Everyone needs a break now and then. It’s been nice to take a creative writing break over the past month and just let my brain decompress, while hopefully expelling some unnecessary clutter and making some room for new writing ideas to percolate. I decided to do this around Christmas and to just enjoy the holidays and time with my family without worrying about what my next article would be about. Speaking of percolating, I received the best and most useful Christmas present from my wife and son last month and I’m sure they were relieved that I actually asked for this one instead of leaving them guessing about what to get me. It’s a new Keurig coffee brewer and I have to admit that it’s the neatest thing since sliced bread. People that know me also know that I love coffee and that I am still searching the Bible for a reference as to which day God created it on. Making a cup of coffee has never been so easy for me now. Before, when I wanted coffee at home, I would pour the beans into the grinder and obliterate them into coffee grounds. I would then fill the percolator up with water, pour the grounds into a metal basket, put all the machinery into the pot, clamp down the lid and turn it on. About seven minutes later I would have a steaming pot of coffee that smelled and tasted wonderful but it would always be more than I could drink so much it went to waste. Oh, and then there was the fun job of dismantling and cleaning all the individual parts of the percolator afterwards. Sure, a Mr. Coffee drip coffeemaker is probably easier but I have never thought it was nearly as good as making coffee in a percolator so I did it the old-fashioned way….until now. The Keurig suddenly became my new best friend and into the carousel that my in-laws got for me went all kinds of “K-Cups”….small, sealed cups filled with just the right amount of ground coffee that, when placed in the machine, allows it to brew a single cup of coffee at a time….and not just any old coffee either but very good coffee! I have a variety of blends to choose from… deep, rich dark roasts in the morning to light, aromatic coffees in the afternoon and even decaf for the evenings made by a company called Donut House whose coffee tastes like it was fresh brewed at the Krispy Kreme. I have gotten so much use out of it that I even went and bought another one for my office so I can enjoy good coffee at work too. It’s amazing how much better the day goes with good coffee as opposed to the stuff that gets brewed in the morning and sits in the pot slowly burning most of the day. The holidays were good overall and I got to watch my son have a lot fun opening his gifts at Christmas. A friend gave him a Red Rider BB gun and, thankfully, a pair of safety glasses so he won’t “shoot his eye out” while he is out stalking unsuspecting Coke cans and empty water bottles in the woods behind our house. He also got a lot of other stuff, probably more than he needed, but we always make room for it by finding homes for some of his other things that he doesn’t play with anymore. Since he is closing in on nine years old, I suspect there will be a lot more “cool stuff” in the future and less “play stuff” so I treasure these moments and commit them to memory. My wife and I gave ourselves some new furniture, the first we have gotten since we moved into our house 11 years ago. We even managed to dispose of our old furniture without a yard sale….the power of Facebook took care of that every piece was claimed within hours of her posting it. Did I say 11 years?? Time really does fly and you soon realize it is going by faster than you would like. I hope in 2013 I find a way to tap on the brakes just a bit and slow it down but I suspect others have tried that and haven’t found that magic brake pedal yet. The holidays weren’t without some sadness too. My grandmother, who had been declining since before Thanksgiving passed away on New Year’s Eve but she had such a long and wonderful life that I couldn’t really be sad for her but rather, happy that she came into my life when she did and that I got to have her in it for so long. Her homecoming service was beautiful and I got to say a few words about what she meant to me and to others as we celebrated her life. In looking back at 2012, I realize there are quite a number of days and events that I would just as soon leave behind but I know that I had a lot of good experiences that year as well. I got take to take a really great vacation with my wife, my son, my mother and a lot of cousins I care a great deal about. I got to take my son on our first father-son trip together and we had a really fun time together cruising through the mountains of North Georgia, North Carolina and Tennessee. I bought a totally impractical car and have enjoyed every minute of it. I got a major promotion at work and was honored by my community. I watched my son grow a little older, a little more self-confident (he flew by himself for the first time this past summer) and I continue to be amazed at how he can amaze me. I even managed to maintain the weight I lost in 2011, give or take a couple of pounds. These and several other things helped balance the loss of a grandmother, a couple of friends and a couple of really bad days. The days and events that make up a year are a lot like the variety of “K-Cups” that sit next to my new coffeemaker. Each one is a unique and individual experience. Some are delightful, some are rich, some are satisfying and some are stimulating….and some you would just as soon not try again. Most of them leave you looking forward to the next one but a few you are happy to just leave behind. That is the beauty of the holidays, of a year in one’s life and really, of life itself. It is the experiences, both good and bad, that give life the flavor that we get each time we take a taste of it. Each day brews up a new experience and we never know what that will be until we try it. As for me, I’m looking forward to that next cup of coffee and writing about it all. Loved this article and glad “you are back to blogging”. BTW, now I am fired up to get me the Keurig that David said I could have for Christmas…which model did you buy? Recommendations? 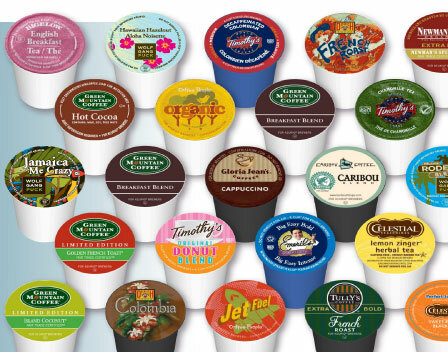 K-cup or Vue, etc. Definitely the K-Cup..it works great. I wish I had the model number but the one at home has the digital display and makes multiple sizes. The one at work I bought at the local grocery store and it just has two cup size settings. Prices range from just under $100 to about $200 from what I’ve seen.